As we prepare to celebrate the Solemnity of the Body and Blood of Christ this weekend, perhaps you'll find this poem from the Concord Pastor helpful for your prayer. flowing all through you: life. This past weekend Pope Francis visited a parish in Rome and at the end of Mass the First Communion children came forward, gathered around the altar, and with the accompaniment of a guitar sang a blessing on the pope who kept his head bowed through the whole piece. And that is how Theology started. People already knew about God in a vague way. Then came a man who claimed to be God; and yet He was not the sort of man you could dismiss as a lunatic. He made them believe Him. They met Him again after they had seen Him killed. And then, after they had been formed into a little society or community, they found God somehow inside them as well: directing them, making them able to do things they could not do before. And when they worked it all out they found they had arrived at the Christian definition of the three-personal God. He turned out to be a fanatical, in-your-face, obnoxious Notre Dame alumnus! You ever met one? Nice to meet you! Now I guess I am proudly one, after the privilege of this honorary degree which I so appreciate and cherish! He begins to speak with obviously radiant pride and gratitude about Notre Dame, telling me his faithful Jewish parents wanted him to attend a Catholic college – - because, in their words. “The Church founded the universities, and educate better than anybody else” – - and reporting to me that, even as a faithful Jew, he considers his four years here at this Catholic university a gift beyond measure. When I told him I’d be here for graduation, he beamed. Thank you, Howard. Hope you’re listening to me now, as you promised me on that train you would. Because with those words you solved the riddle about what I should say in these few moments. That was Mother’s Day weekend; it was May, the month dedicated to her; and I had just returned, with fifty sick and disabled people, from a pilgrimage to the “real” Lourdes in France. So obvious I had almost missed it … I’m going to speak of Notre Dame … Notre Dame … our Lady …. Mary, the mother of Jesus. “The apostles were in continuous prayer, together with Mary, the mother of Jesus …” writes St. Luke in the Acts of the Apostles, in the account of Pentecost. “All things rising, all things sizing, Mary sees sympathizing …” … claims Gerard Manley Hopkins, as you, the class of 2013, have sensed her maternal presence “rising, sizing, and sympathizing” these blessed years on a campus wrapped in her mantle, and praise God that Father Sorin and that pioneer band of priests and brothers of the Congregation of the Holy Cross placed this most noble endeavor under her patronage from day one 171 years ago. Might I propose to you, my new classmates, class of 2013, that she’s not just our patroness, but our model. It all comes down to this: she — Miriam, Mary, Notre Dame, our Lady — humbly, selflessly, generously, with trust, placed her life in God’s hands, allowing her life to unfold according to His plan. She gave God’s son a human nature; she gave the Eternal Word — God the Son, the second Person of the Blessed Trinity – - flesh. That’s called the Incarnation. God became one of us. Pope Francis shared the following at Mass Thursday morning in the chapel of the Domus Sanctae Marthae residence in the Vatican. 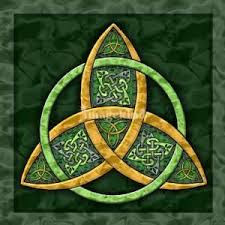 “If the idea of God as both Three and One seems farfetched and obfuscating, look in the mirror someday. There is (a) the interior life known only to yourself and those you choose to communicate it to (the Father). There is (b) the visible face, which in some measure ” reflects that inner life (the Son). And there is (c) the invisible power you have which enables you to communicate that interior life in such a way that others do not merely know about it, but know it in the sense of its becoming part of who they are (the Holy Spirit). Yet what you are looking at in the mirror is clearly and indivisibly the one and only you. The Marianists of the Province of Meribah hosted their Spring Operation Fiat last evening at the Chaminade-Mineola Community. The Chapel was filled to capacity with Marianists and students from our high schools interested in learning and exploring a Marianist Religious vocation. After Adoration of the Blessed Sacrament and Evening Prayer a theme for the evening was explored by Brother Stephen. He spoke how we must be utterly possessed by Christ, utterly impassioned by His love and grace, utterly ablaze with His power and glory. Every earthly part of our being must glow with God's fire divine. As at Pentecost, the apostles were set ablaze. 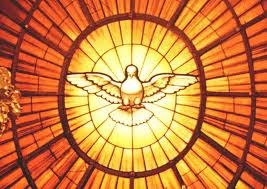 So we too, ask the Holy Spirit to descend upon us anew! 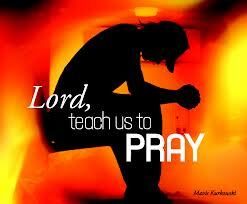 Set us ablaze, Lord, set us on fire! Have you ever thought of committing your existence totally to Christ? Do you think that there can be anything greater than to bring Jesus to people and people to Jesus? I love our Church! I really and sincerely do. I love everything about our Church. 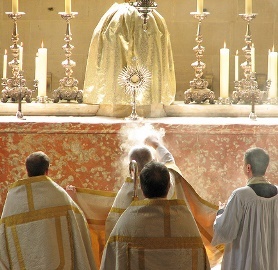 I love the sights of the buildings and the Liturgy, the sounds of the old Gregorian Chant music, the smells of the incense, the physicality (touch) of the priesthood, the taste of the Body and Blood of Jesus. I love it all! All of these are fair questions, to which I would respond and paraphrase St. Paul in Eph. 5:25 “Love the Church as Christ loved the Church.” If Christ loved the Church so much that He died for Her, who are we to spurn what She proclaims as meaningless or inconsequential? If we truly love Christ, then we must love the Church, meaning that we must follow what She teaches, without trying to change it into our idea of Christianity. Was it me that Christ entrusted the Keys to the Kingdom or was it Peter (Mt. 16:16-18) that Christ entrusted? 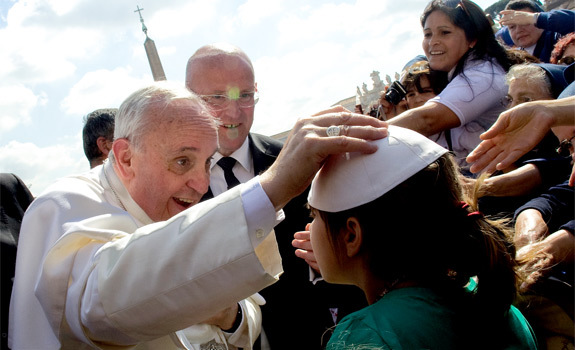 Did He give me authority or did He entrust it to the leaders of the Church? The Church! Jesus entrusted Himself to the Church. Does that mean that I follow or believe everything blindly? Many of the teachings and guidelines of the Church are hard, but if we reject the hard ones and only accept the ones that fit our idea of Christianity, then we totally miss the Beauty of our Church. When we do this, when we try to boil down all the teachings and guidelines of the Church and Christ into what we think it should be and reject the authority that Christ gave the Church, then it is no longer Christ’s Church or the Catholic Church but, rather, Chris’s Church or the Church of Me. It’s okay to question and struggle with the teachings of the Church. It’s okay to say I don’t know what this means. Not every part of our faith is a point to be solved and dissected under a microscope. If our God could be “solved” or “figured out,” then He wouldn’t be a very great God, would He? Only too often do we try to do it on our own, and we completely miss the Beauty of the mystery of our faith and the Beauty of obedience to whom Christ entrusted the Church. Loving Christ means to love the Church, and that means loving all parts of Her. 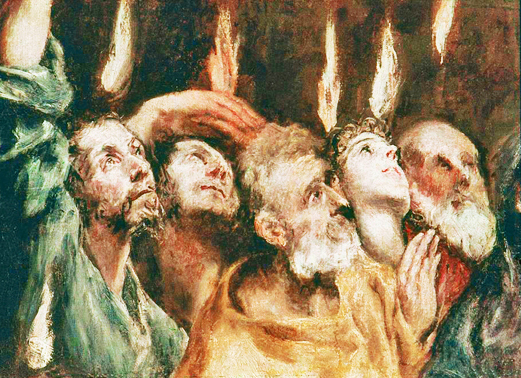 The coming of the Holy Spirit on Pentecost lit the fire of the Church. God’s Spirit is still and must always be the main source of light for Christians. Individually and as the Church, we should do what is necessary to keep ourselves good places for the Spirit’s flames to burn hotly and the Spirit’s light to shine brightly. It’s not our job to extinguish lesser lights that shine for the benefit of humankind so that we’re the only light in town; indeed, sometimes we should help their light be seen. At the same time, however, we should never be so dazzled by other lights that we no longer shine for Christ or no longer “reproduce” and bring forth new generations of Christians. Pentecost has been one of the most unique and creatively celebrated days on the church's calendar. In 10th-century Rome, for example, the church really knew how to throw its own birthday party. In order to make the coming of the Holy Spirit a dramatic, dynamic event for their congregations, leaders of Pentecost services involved architecture, not just anthems. The custom of painting heavenly scenes on the great domed and vaulted ceilings of cathedrals served not only to inspire the devout with blessed visions. It also disguised some discreet trap doors. These small openings were drilled through the cathedral ceiling to the rooftop. During the Pentecost service, some hapless servants would be drafted to clamber up on the roof. At the appropriate moment during the liturgy, they would release live doves through these holes. From out of the painted skies and clouds on the cathedral ceiling, swooping, diving symbols of a vitally present Holy Spirit would descend toward the people below. At the same moment, the choirboys would break into the whooshing and drumming sound of a holy windstorm. Finally, as the doves were flying and the winds were rushing, the ceiling holes would once again be utilized -- as bushels upon bushels of rose petals were showered down upon the congregation. These red, flickering bits of flowers symbolized tongues of flame falling upon all who waited below in faith. They called these openings to the sky in medieval churches "Holy Spirit holes." 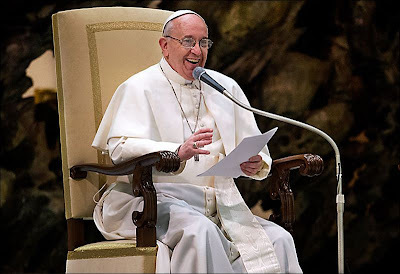 To the participants in the plenary assembly of the International Union of Superiors General (UISG) Pope Francis spoke on Wednesday, May 8, 2013 about the Evangelical Counsels. Take three minutes out of your day and be moved beyond words. This beautiful video looks at two people who are living the answer to that question—”What is love?”— every moment of their lives. Pure Jerzy Kidz, a choir that includes children from five South Jersey schools, was formed to sing “Mom,” a song with lyrics by Father Edward Namiotka, pastor of St. Joseph Parish in Somers Point. It is available on iTunes, Amazon, Google Play, and other digital music stores. It is also available as a CD single, and a music video recently premiered on YouTube. Father Edward Namiotka, pastor of St. Joseph Parish in Somers Point, wrote the lyrics to “Mom” last year, when visiting his mother during one of his monthly visits to her Jersey shore residence. 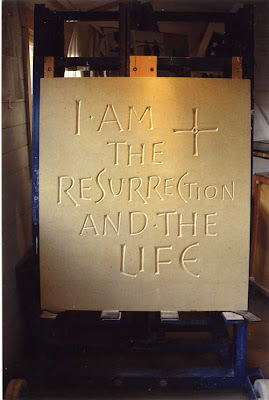 His sister, Cathy, was visiting as well, with her youngest son, and inspiration struck. Cathy’s son was “cranky after just getting up from a nap and I watched as Cathy held him, tried to cheer him up and simply gave him her time and attention,” he wrote on his blog, www.fr-ed-namiotka.com. “The moment was priceless as I looked at the young mom (my sister Cathy) take care of her 2-year-old and the slightly older mom spend her time with her 52-year-old son.” Driving back to the rectory, Father Namiotka wanted to capture this experience, and his thoughts also drifted to the icon of Our Lady of Perpetual Help, with the Mother of God holding the Divine Child in her arms. Soon, a melody and lyrics came to mind. Father Namiotka recruited Julie Linn, a friend and music/choir director and vocalist from his former parish, and Scott Armato, who provided the piano accompaniment and harmonies, and children from five different schools in South Jersey, Edgarton Christian Academy, Newfield; Cleary Elementary, Buena; Main Road, Franklinville; St. Joseph Regional School, Somers Point; and Joy D. Miller School, Egg Harbor Township . The combined choir, Pure Jerzy Kidz, recorded his tune at CAS studios in Vineland. Watch the video below. Happy Mother’s Day! 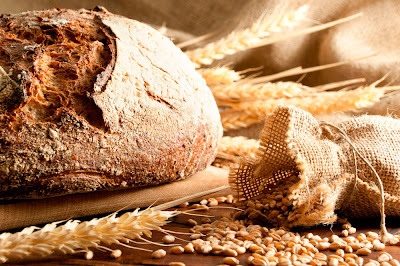 In the Last Supper, Jesus addressed these words to the Apostles: “You did not choose me, but I chose you” (John 15:16), which reminds all, not just us priests, that a vocation is always an initiative of God. It is Christ who has called you to follow him in the consecrated life and this means to continually engage in an “exodus” from yourselves to center your existence on Christ and on his Gospel, on the will of God, divesting yourselves of your plans, to be able to say with Saint Paul: “It is no longer I who live, but Christ who lives in me” (Galatians 2:20). This “exodus” from oneself is to put oneself on a path of adoration and service. An exodus that leads us to a path of adoration of the Lord and of service to Him in our brothers and sisters. To adore and to serve: two attitudes that cannot be separated, but which must always go together. To adore the Lord and to serve others, not holding anything for oneself: this is the “divestment” of one who exercises authority. 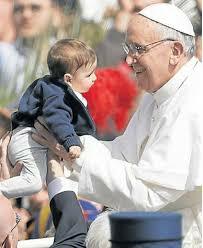 Live and recall always the centrality of Christ, the evangelical identity of consecrated life. Help your communities to live the “exodus” from themselves on a path of adoration and service, first of all, through the three foundations of your existence. To understand the Ascension event, our task is two-fold. 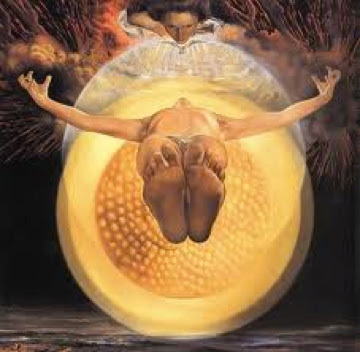 First, we must realize that the Ascension represents an attempt to do the impossible - use the language of space and time to describe a reality that intentionally transcends both. As a literary tradition, the Ascension "worked" to explain Christ's departure from the physical world no better for first-century Christians than it does for 21st century, scientifically sophisticated Christians. Thus the second task for us is to discern what message the Ascension communicates beyond space and time. By lifting Jesus out of first century Judea, the risen Christ of faith becomes personally knowable to every new generation of believers in every place on this earth. The Ascension makes every person a contemporary of Christ. Through the gift of the Holy Spirit there are no second-hand disciples. An old saying puts it best when it asserts that "God wants no grandchildren, only children." A Christian who constantly complains, fails to be a good Christian: they become whiners. Christians should endure their difficulties in silence, in patience to bear witness to the joy of Christ. This was the message at the heart of Pope Francis’ homily Tuesday morning, during Mass with staff from the Fabric of St. Peter. 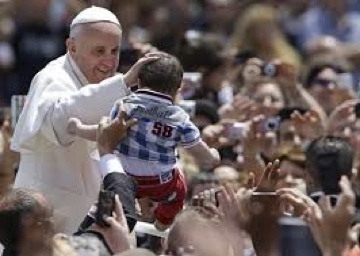 Thus, concluded Pope Francis, a Christian is called to endure their troubles just like Jesus, “without complaint, endure in peace.” This patience, “renews our youth and makes us younger”. Time to open the Scriptures and begin to prepare to hear the Word to be proclaimed this Sixth Sunday of Easter. The first reading this weekend tackles the issue of whether or not Gentile converts to Christianity needed first to become Jews. The second reading offers another awesome vision from Revelation. The temple in Jerusalem had been destroyed - John offers here an image of a new Jerusalem descending from heaven - for John that's the Church of Christ, standing on the foundation of the 12 apostles. And what glorious imagery for the Lamb of God! Today's Gospel takes us back to Jesus' farewell discourse at the Last Supper in which the Lord promises to send an Advocate, the Spirit, and to leave with his friends the gift of his peace - a peace beyond any the world might offer. Sunday’s reading from the Gospel of St. John invites us to think about something else that shouldn’t be stuck on: love for Jesus and for one another. In our reading from John’s Gospel, Jesus tells his followers that those who love him will keep his word — follow him faithfully. That means we need not make a fake commitment but a real one. In calling us to follow him, Jesus wasn’t necessarily calling for feelings but rather for actions. 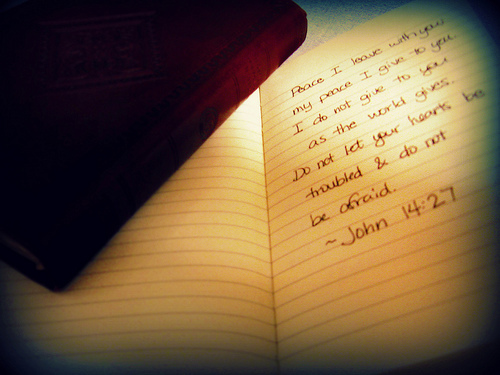 Jesus talks about “keeping” — keeping his commandments, keeping his word, keeping his words . “Keeping” is a verb, an action word. It is significant that Jesus’ statement about keeping his words has a future tense cast to it. It isn’t stated as an order — “If you love me, keep my words” — but — “If you love me, you will keep my words.” That distinction is important, for it means that applying Jesus’ teachings will flow naturally out of our commitment for him. 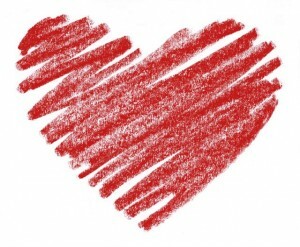 It is much like saying if you love your spouse, you’ll think of good ways to show it. It will happen naturally. The actions we take in Jesus’ name flow out of our inner nature. Not our unredeemed inner nature, not the nature we were born with, but the nature we were reborn with. In other words, the action flows out of our commitment to keep Jesus’ words. The Marianists of the Province of Meribah recommend to your prayers MR. JAMES CONWAY, the father of Brother James Conway, S.M..
Mr. Conway died on May 2, 2013, in Mineola, N.Y. If You, O Lord, mark iniquities, Lord, who would survive? 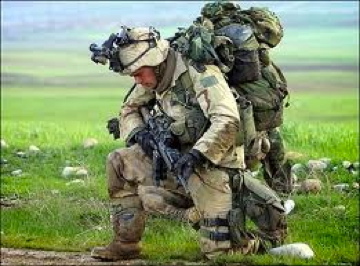 My soul waits for the Lord more than watchmen wait for the dawn. This Sunday's reading is so helpful. It gives us an expanded picture of heaven that is wonderfully earthy. It's tangible. Concrete. We can wrap our minds around it. It's not a vision of angels and harps -- it's what we see when we walk out the doors of our homes. It's a city! - the city itself and its streets made of pure gold. Despite how literally or symbolically you read Revelation, we can all agree that this city is intended to blow away any concept of structure we could ever imagine. But the wonder of this city isn't in what it's made of -- it's what it represents. God could have created anything as eternity -- God is God! But in choosing this New City as our eternity in the New Heavens, God sent some clear messages about life then and now. Archbishop Emeritus Raymond Roussin, SM, Brother Bill Bolts and Brother Richard Joyal. There are two sides to hospitality. The one we are most familiar with is our call to open wide our arms and doors to others, to welcome both friends and strangers. The other side is to freely receive hospitality, to allow ourselves to be welcomed by another. Sometimes, this latter form of hospitality is the more difficult. When we give hospitality, we are on our own turf. When we receive hospitality, we are called to embrace new surroundings, new people and new ways of doing things. It is an ungracious guest who complains that "this is not how we do it at home," constantly craving and whining for the comforts of the well-known while unwilling to try the new. A person with a true missionary heart knows this. We can no longer cling to the old colonial mentality of "saving" our sisters and brothers by forming them into persons and cultures in our own image. If we travel to other countries, we do so as guests. We must have willing minds and hearts to embrace the new and unknown. We must allow ourselves to be formed by another culture. And we must have a deep love and respect for the people and country that have welcomed us. Marianist Brother Richard Joyal had such a heart. In 1983, he left his community in Winnipeg, Canada, and went to work in the newly founded Society of Mary foundation in India. He relished his work in India, which included projects with street children and novice formation. In the midst of the poverty, he saw the beauty in simplicity. He shared with us his newfound passion for growing orchids, transforming our own Western images of India as a land of slums to a land with incredible natural beauty. In 2004, he moved to the Philippines to begin a new Marianist mission. Again, he fell in love with the people, the land and the culture. 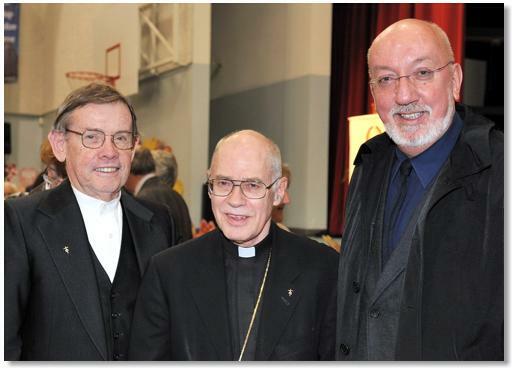 He recently returned to Canada and was living with the Marianist community in Québec. He became the director of Le Centre Marianiste d'Éducation de la Foi, injecting the same enthusiasm and passion into this work. A few months ago, he agreed to travel to Haiti to assist with the closure of the Society of Mary mission in that troubled land. Where others saw only poverty and despair, he spoke enthusiastically of the deep faith and liturgical celebrations of her people. In an Easter message to a friend, he wrote, "I knew all along that Jesus was Indian. I also discovered that he was also Filipino. Now, I am discovering that he's Haitian. " On Thursday, Brother Richard was killed on the streets of Port-au-Prince just days before he was to travel back home to Québec. Sr. Laura Leming, a Marianist sister in Dayton, shared this simple comment on Facebook: "Rest in peace Richard, and leave us a portion of your missionary spirit!"